Last year I did make a posting about counting all the provinces I had been in Thailand. And I saw I have been to (stayed in) 48 provinces out of the 76. So in the coming months I will travel via my postings from the most southern province I have been to the most northern province, with some photos and information about each province. This is part 6 of the 47 (out of the 77) provinces where I have at least stayed overnight once. 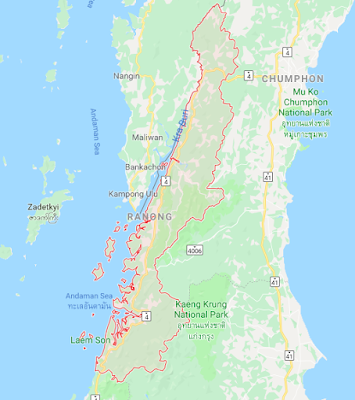 The name of Ranong province in South Thailand is not to be confused with the name of Rayong province along the Eastern Seaboard of Thailand. Ranong province is a long stretched province about in the northern area of South Thailand and bordering the Andaman Sea on the west-coast of South Thailand. But also bordering Myanmar. The capital town is of course Ranong town. Ranong province can be reached by bus and air (UNN). Personally I did visit Ranong province only once in 1995 when traveling from Phuket to Bangkok via route 4. And I did only stay 1 or 2 days in Ranong town. Ranong must not have impressed me much as I can not find any photo of Ranong in my more 15.000 travel photos. So yes the photo above is not mine. But Ranong is famous as the town of spa & hot-springs. 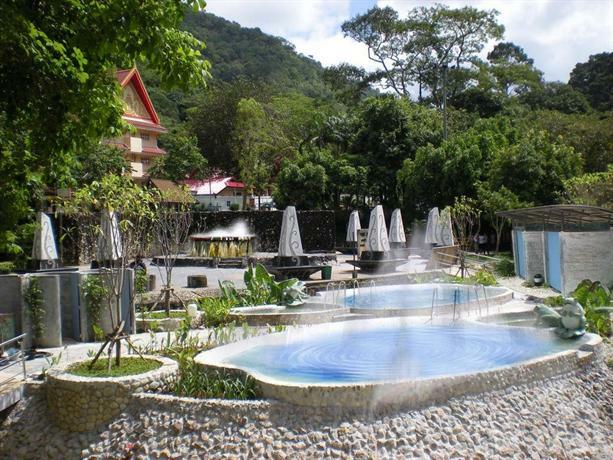 And that is what I remember, that we did visit a spa & hot-spring in Ranong. What was a weird experience, at the entrance men and women had to go to different changing rooms but we expected to join together at the spa. But no, the big spa & hot-spring had a wall in the middle to separate man and women. And the water was so hot that I thought it would be a bad idea to go sit in it. Well that was Ranong for me! But of course Ranong province has much more to offer with a beautiful coast and islands like Koh Chang (not to be confused with Koh Chang in Trat province) and Koh Phayam. And of course many people will know Ranong as the place to make a visa-run to Myanmar. Definitely a province to explore again in the near future.